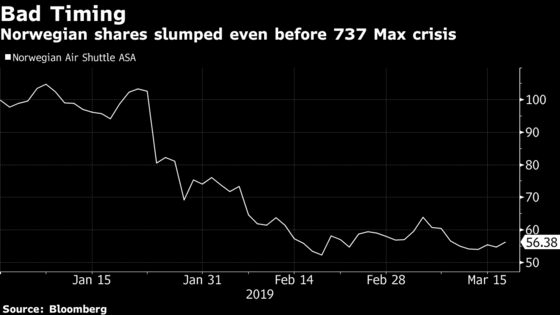 (Bloomberg) -- Norwegian Air Shuttle ASA’s reliance on the fuel-saving Boeing Co. 737 Max to underpin its ultra low-cost trans-Atlantic strategy has exposed the loss-making carrier as the most vulnerable in Europe to the worldwide grounding of the plane. Norwegian was among the earliest adopters of the new narrow-body jet, using its extra range to launch services on Europe-U.S. routes traditionally dominated by twin-aisle planes. 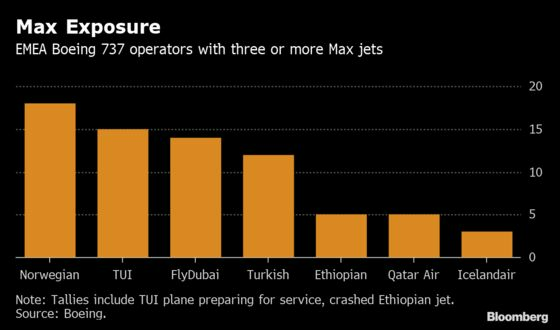 But after the fatal crash in Ethiopia on March 10 put the Max out of action, the airline has been forced to scrapped some flights and switch others to bigger aircraft, increasing costs and reducing competitiveness in an already cut-throat market. The groundings will “change the dynamics” of Norwegian Air’s operations but not the way it moves forward, according to a spokesman. The 737 crisis has hit at a time when the carrier can least afford disruption. Norwegian is already grappling with a cash squeeze from splurging on planes and was forced to raise fresh funds in a rights issue this month. The move came after British Airways parent IAG SA dropped a takeover approach, helping to send the stock tumbling. The shares dropped as much as 8.4 percent on Wednesday and were trading at 51.60 kroner as of 3:33 p.m. in Oslo, taking losses to 48 percent since the start of the year. The 737 grounding is costing Norwegian 5 million kroner to 15 million kroner ($586,000 to $1.76 million) a day, according to Ole Martin Westgaard at Oslo-based DNB bank, while Sanford C. Bernstein’s Daniel Roeska estimated the hit at about 7.2 million kroner. Norwegian told Bloomberg it’s too early to put a figure on the expense of the upheaval. While the carrier has said it’s “obvious” that expenses should be reimbursed by Boeing, Westgaard said the situation is unclear and that the reduced market value of the Max could “significantly hurt” the company’s sum-of-parts valuation. Andrew Lobbenberg at HSBC, though, suggested that the groundings and delivery delays may be to the advantage of Norwegian in that they should “reduce pressure on pre-delivery payments” and boost the value of its existing fleet of older 737s and a backlog of Airbus SE A320neo orders. At the same time he cut his target price for Norwegian Air stock by more than half to 20 kroner, citing the impact of capacity reductions. The discount carrier has 18 Max jets, making it the biggest operator of the model in Europe ahead of German holiday company TUI AG, which has 15. Norwegian usually deploys them on services from Scotland and Ireland to the U.S., and between Norway and the U.K. While it’s now using older 737s on the latter routes, flights from Edinburgh to Stewart in upstate New York were terminated. Services from Dublin to Stewart and Providence, Rhode Island, were combined into a single flight to the New York town using a Boeing 787 sourced from Norwegian’s London Gatwick wide-body hub. People going to Providence have to complete their journey by bus, a spokesman told Bloomberg. TUI is relying on other planes to cope with the Max grounding, which affects 10 percent of its 150-strong fleet, while leasing in one or two extra jets a day and more on weekends. It has also rerouted some flights, changed departure times and will postpone non-critical work, such as repainting, to maximize resources, a spokesman said. In the Middle East, FlyDubai, which has 13 Max planes representing 12 percent of total capacity, is canceling up to 15 flights a day. Customers are being given the option of re-booking with the airline, transferring to sister carrier Emirates, or receiving a refund. The 737 Max was grounded around the world amid concern the African tragedy that killed 157 people on board was caused by the same combination of malfunctioning sensors and a computer system that took over the plane that was blamed for a Lion Air crash last October. Boeing has said it’s finalizing software and pilot-training updates to address the issue, though the company’s best-selling jet is expected to remain grounded at least through April. Norwegian’s use of the 737 Max and 787 allowed it to steal a march on bigger rivals by utilizing the improved efficiency of the new aircraft to offer trans-Atlantic fares they couldn’t match. But problems with the planes have made the bet look like a bad one. The 787 fleet has already been affected by engine problems at Rolls-Royce Holdings Plc. Norwegian said in October that the 787 engine issues had already cost it 1 billion kroner, including customer claims after airports struggled to cope with a rented A380 superjumbo. Like other Northern Hemisphere airlines, the grounding has come during the low season for Norwegian, when part of the fleet typically stands idle, and could prove more disruptive once demand begins to climb toward summer. The carrier has already been slowing its capacity growth with the closing of four European bases and a slowdown in its long-haul expansion. The Edinburgh-Stewart route was earmarked to shut later in the year.